The third edition of the Kenya Pipeline Company (KPC) Thange cross-country race which featured senior and junior men and women took place on Saturday, 16 February 2019 in Makueni County. The event was held in conjunction with Athletics Kenya Southern region branch as part of the company’s corporate social investment programme following the 2015 oil spill in the area. Addressing the participants during the well-attended race, KPC Chair John Ngumi hailed the runners for putting their best forward to run for the noble cause. “We promised you the people of Thange that this year, the race will take place right in your backyard, and this has happened. KPC is delighted to build a long lasting bridge to help local youth develop their sporting talent. This is why we are here today and KPC will continue to support this noble cause in the years to come,” Ngumi said. KPC acting Managing Director Mr Hudson Andambi acknowledged the importance of tapping the rich hidden talent in Makueni County. In a speech read on his behalf by acting General Manager Strategy Disterius Nyandika, he applauded the local community of Thange and the larger Makueni County for their huge support during the inaugural cross-country race in 2016 and most importantly during the clean-up exercise following the 2015 oil spill. “It is our corporate tradition to always partner with communities that host us and our facilities through various strategies of mutual benefit. 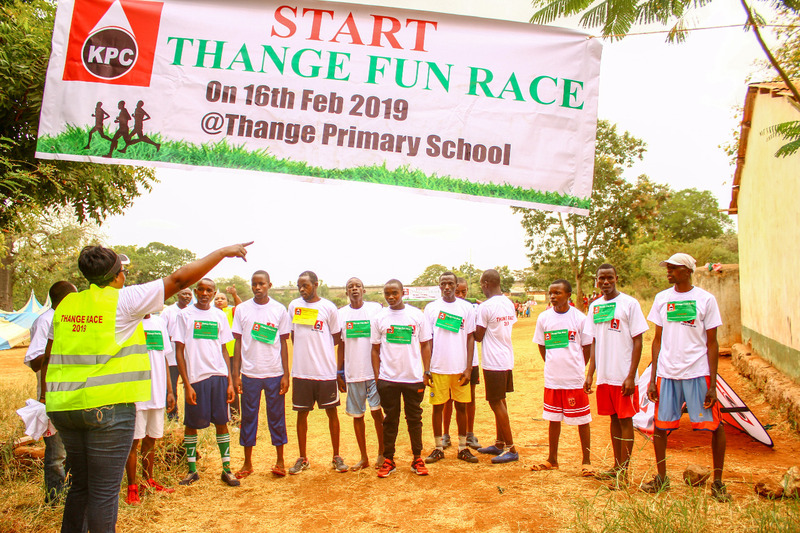 Thange has a special place in our community of partners and we feel proud that we are able to carry out a sports activity that will in the long run see the transformation of young people who can develop their running potential to career level and earn from it,” Andambi said. the people to become change agents in their own communities. This is what our corporate social investment agenda is all about,” he added. During this year’s event, winners of the various categories, which also featured children and adult races received enhanced cash prizes for the top five for each of the categories. The prize money was distributed in kind and in form of vouchers for food from local traders and some cash to meet other household needs. Children winners received vouchers for school books from a local bookshop. Sh15,000 while first runners up Joseph Kilonzo received Sh12,000. 63-year-old Mzee Patrick Mutie Kimeu won the category for the elderly while Evans Kioko won the People Living with Disabilities category.